Voices In Time is a standards-based elementary and middle school sing-along history session! For over a hundred years, these songs have traveled through time by word-of-mouth, woven by our ancestors into the fabric of our nation. 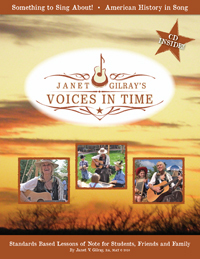 Each song is a primary source of historical information that serves as a storehouse of thought and emotions from ancestors living in times prior to electronic media…when songs preserved history of common folk – on the trail, in the field, around the campfire, church, and school, all the while transferring information from generation to another. Enjoy the journey as we participate in the ancient tradition, sharing our history through ballads and folk song – a custom shared by all peoples, since the dawn of civilization.